Peaceful and powerful are the hallmarks of the work of professional artist Greg Hostetler. Simple designs offset the compelling use of deep colors and depth that seem to work in any setting or color scheme. Hostetler comes from a family with a long history in fine art. As a Florida native Hostetler spent much of his time in the outdoors; always in search for inspiration for his work. During frequent family trips Hostetler would attend as many art venues as he could. He also visited his Aunt and renowned artist Donna Kubley a painter and sculptor living in Lexington Kentucky. As a child, Hostetler immersed himself in art when he visited Kubley in her studio on those vacations. Twenty years after Kubley's passing, Hostetler still fines inspiration in Kubley’s work. "My Aunt was the catalyst that really inspired my work" said Hostetler. "Her neutral backgrounds always enhanced the object of the piece she was painting and moved me to pick up a brush." Hostetler received his formal education in the seminary where he earned a bachelor's degree in Theology, and this seems to have highly influenced his subject matter. His subjects are typically that of nature painted in acrylic or oil with bold tones. "I want my work to convey mood, feeling and emotion," said Hostetler. "These subjects are painted as if in a single moment of time, in tranquil peaceful settings, just the way God intended." Hostetler, is now represented by the prestigious Hyder Gallery Center of Fine Art, in Lake Mary Florida. “Not only has Greg's work really resonated well with our collector base", said Andrew Hyder Curator of the Hyder Gallery center for Fine Art, but he is a true professional that is completely on top of his game". Hostetler is currently expanding his gallery representation within the Southeastern states. 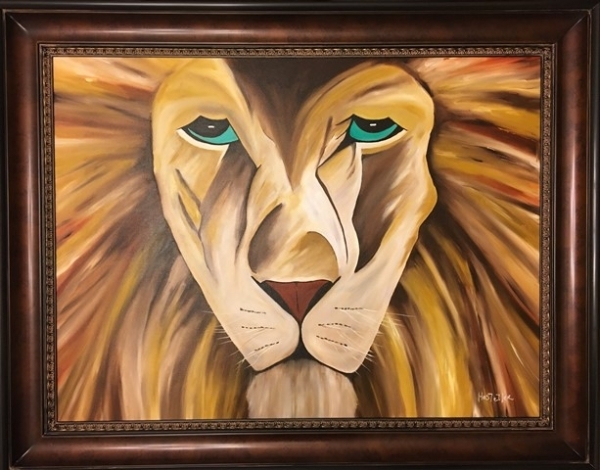 Face of Lion with bold features, with a beautiful mahogany frame. Height 38" x Width 48"
The lion is a fierce hunter in the wild. This lion was created with bold features, scared from his experiences. Whether they are scars of beauty or scars of ugliness, its in the eye of the beholder. The dark wood frame completes the bold features of the lion. Greg Hostetler Professional Artist Peaceful and powerful are the hallmarks of the work of professional artist Greg Hostetler. Simple designs offset the compelling use of deep colors and depth that seem to work in any setting or color scheme. Hostetler comes from a family with a long history in fine art. As a Florida native Hostetler spent much of his time in the outdoors; always in search for inspiration for his work. During frequent family trips Hostetler would attend as many art venues as he could. He also visited his Aunt and renowned artist Donna Kubley a painter and sculptor living in Lexington Kentucky. As a child, Hostetler immersed himself in art when he visited Kubley in her studio on those vacations. Twenty years after Kubley's passing, Hostetler still fines inspiration in Kubley’s work. "My Aunt was the catalyst that really inspired my work" said Hostetler. "Her neutral backgrounds always enhanced the object of the piece she was painting and moved me to pick up a brush." Hostetler received his formal education in the seminary where he earned a bachelor's degree in Theology, and this seems to have highly influenced his subject matter. His subjects are typically that of nature painted in acrylic or oil with bold tones. "I want my work to convey mood, feeling and emotion," said Hostetler. "These subjects are painted as if in a single moment of time, in tranquil peaceful settings, just the way God intended." Hostetler, is now represented by the prestigious Hyder Gallery Center of Fine Art, in Lake Mary Florida. “Not only has Greg's work really resonated well with our collector base", said Andrew Hyder Curator of the Hyder Gallery center for Fine Art, but he is a true professional that is completely on top of his game". Hostetler is currently expanding his gallery representation within the Southeastern states.